Subscribe to the Mobile Overview Report (MOVR). Learn more during our MOVR release webinar on February 12th. Listen in and get a chance to ask questions. With 54% NFC support in 2015 and 73% in 2018, we’ve seen a 19% increase in the last three years. Most of the growth was driven by Apple’s adoption of NFC in their iPhones. For more on this, we delve into growth of NFC support by operating system. In 2015, Android was the most prevalent operating system for NFC support. Android has been consistent, keeping 61% share of NFC supported smartphones three years later. However, it’s Apple’s iOS operating system that has shown the biggest change and in 2018, the biggest share of NFC support on smartphones. With a 60% increase in support in three years, iOS has certainly overtaken the NFC support of smartphones, starting with the inclusion of it in the iPhone 6. We’ve also seen a global trend of NFC support throughout the world over the last three years. In every continent, NFC support is on the majority of smartphones now, but that wasn’t always the case three years ago. 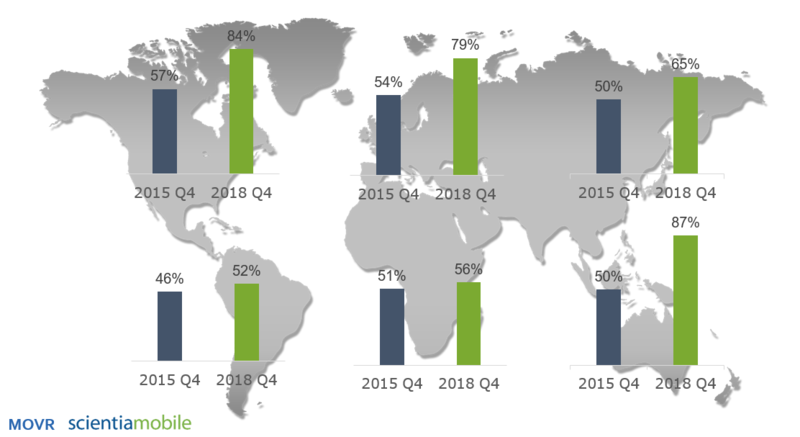 For example, North America, Europe, Asia, Oceania, and Africa all had a majority (more than 50%) NFC support for smartphones in 2015, but South America did not, with 46% support. Growth for NFC support over the last three years has been the largest in Oceania (37%), North America (27%), and Europe (25%). These continents also have a large share of iPhone usage. We take a closer look at the correlation between high iPhone usage and NFC support. In 2018, we have found that the continents with the highest amount of NFC support also have the largest amount of iPhone usage (Oceania and North America lead with over 80% NFC support). Conversely, where iPhone usage is below 20%, NFC support is the lowest (South America and Africa have slightly more than 50% NFC support). For more details on NFC support (such as NFC support by top smartphone manufacturers, a manufacturer comparison from 2015 to 2018, Manufacturer’s Suggested Retail Price and NFC, and price categories for NFC support in 2015 vs. 2018) please sign up to get our complete Mobile Overview Report (MOVR) emailed to your inbox.